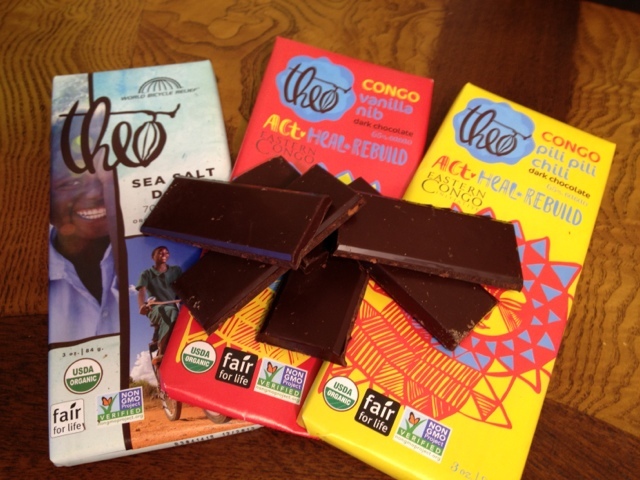 Do You Buy Theo Chocolate Bars for Good or Flavor? Why do you buy any particular chocolate bar? Is it the story behind the bar such as these bars from Theo Chocolate? Is it the flavor? Is it a combination of the two? The two Congo bars pictured here are made by Theo Chocolate who is partnering with the Eastern Congo Initiative, started by Ben Affleck, to support Congolese farmers in Eastern Congo focusing on quality and sustainability. On the interior of the package is a quote from Atandi Isaka, Congolese cocoa farmer which says "Through the ECI-Theo partnership, household incomes have effectively doubled giving farming families the opportunity to take their kids to school and improving their access to health care." The Sea Salt Dark 70% Cacao bar is different partnership with Theo supporting Work Bicycle Relief which provides students, health care workers and entrepreneurs in rural Africa with bicycles. Schools and students, health care, and entrepreneurship. 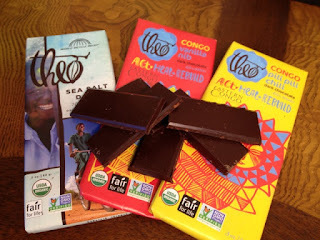 All three chocolate bars support good in another part of the world and the Sea Salt Dark bar even has photos of people who have benefited from World Bicycle Relief. When you are yearning for some chocolate, is it the non profit and the good deeds that you are supporting that prompts you to buy that particular bar? Or, is it that you are seeking a particular flavor, texture, and sweet experience? I'm curious. I'd love to know your thoughts. Hi Barbie. That's a really good question. I'm sure a lot of people will buy them just because it is for a good cause. Hopefully they will like the chocolate and buy some more. As a chocolate lover I would definitely buy them to try the new flavors. If I really like them I may buy them again but I'm more likely to move on and try something new. Thank you for answering! I'm always interested in knowing why people will reach for one chocolate over another. It sounds like you are a bit of an explorer so the new flavors appeal to you. Best wishes on finding new chocolate. Have you tried anything lately that really tickles your fancy?